Women empowerment has hit a new level in Indian when we already had President Pratibha patil, and now in addition to that we have Honorable speaker of the Lok Sabha as Mrs. Meira Kumar. She is certainly the Shankee’s “Up-comer of the week”. The term speaker is a title often given to the presiding officer of a legislative body. The speaker’s official role is to moderate debate, make rulings on procedure, announce the results of votes, and the like. The speaker decides who may speak and has the powers to discipline members who break the procedures of the house. The speaker often also represents the body in person, as the voice of the body in ceremonial and some other situations. 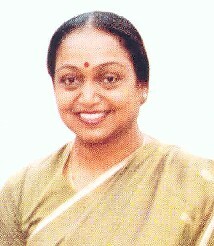 Meira Kumar (born March 31, 1945) is an Indian politician and a five time Member of Parliament. She was elected unopposed as the first woman Speaker of Lok Sabha on 3 June 2009 . She is a lawyer and a former diplomat. Prior to being a member of the 15th Lok Sabha, she has been elected earlier to the 8th, 11th, 12th and 14th Lok Sabha, wherein she remained Cabinet Minister in the Ministry of Social Justice and Empowerment (2004-2009). Meira Kumar was born in Patna to the former Deputy Prime Minister and prominent dalit leader, Babu Jagjivan Ram and freedom fighter, Indrani Devi. She did her M.A., LL.B, Educated at Indraprastha College and Miranda House, Delhi University. In 1973, she joined the Indian Foreign Service and served at embassies in Spain, United Kingdom and Mauritius. She also served as a member of the India-Mauritius Joint Commission. While serving for IFS, she also worked in Embassy of India, Madrid from 1976 to 1977. She was at the High Commission of India in London from 1977 to 1979 and at Ministry of External Affairs from 1980 to 1985. Meira Kumar entered electoral politics in 1985 and was elected from Bijnor in Uttar Pradesh defeating political heavyweights like Ram Vilas Paswan and Mayawati, two powerful dalit leaders. She was a member of the eighth, eleventh and twelfth Lok Sabha’s from Karol Bagh in Delhi. She lost her seat in the BJP wave of 1999, but was able to get re-elected with a record majority from her father’s former constituency of Sasaram in Bihar in 2004 and 2009. She served in the Congress-led Government as the Minister of Social Justice and Empowerment from 2004 to 2009. In 2009 she was briefly inducted as member of the cabinet as Union Minister for Water Resources. On being nominated for the position of speaker, she submitted her resignation three days after assuming ministerial office. She was elected the Speaker of Lok Sabha, thereby becoming the first woman speaker of the country. As a dalit leader, she supports Arjun Singh’s reservation policy for OBCs. She also wants the govt. to offer a reward of Rs. 50,000 for inter-caste marriages. Meira Kumar is married to Manjul Kumar, a Supreme Court lawyer and they have three children, Anshul, Swati and Devangna. 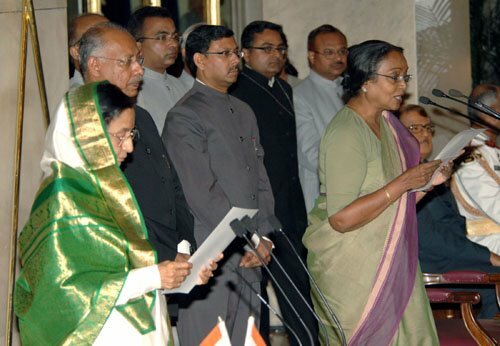 Meira Kumar is a keen sportswoman and she also holds medals for rifle shooting. She has also been a member of (i) India International Centre, New Delhi; (ii) India Habitat Center, New Delhi; and (iii) National Sports Club of India, New Delhi. If you liked this post please do comment. Please do comment if you liked the post and mail us as [email protected] for any queries.